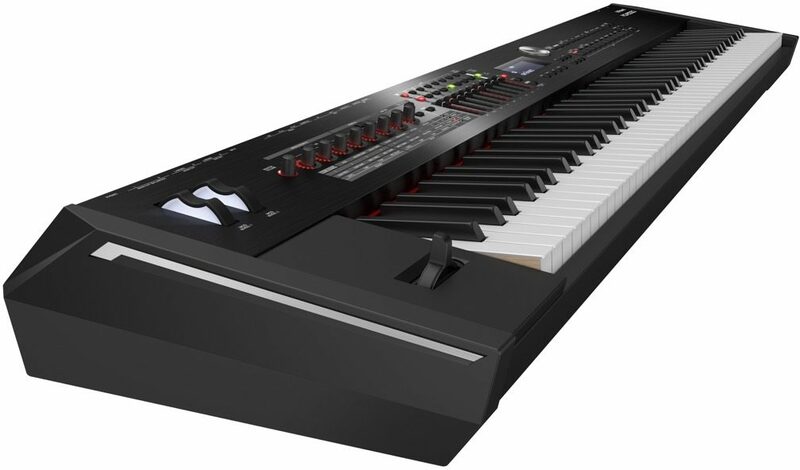 The Roland RD-2000 is a dream come true for the performing keyboardist. It features dual sound engines that power Roland's best acoustic and electric pianos ever, plus the finest action they've ever put in a stage piano. There's a massive selection of top-quality ensemble sounds to cover any musical task, as well as two wave expansion slots for adding even more sounds. And with its innovative modern interface, the RD-2000 is the perfect master controller for working with today's software-based instruments on stage. In a word, the RD-2000's acoustic piano sounds are magnificent. Incorporating Roland's very latest piano technologies and long-running V-Piano research, the acoustic voice is incredibly natural, responsive, and richly detailed. The dedicated acoustic engine features full-keyboard polyphony, allowing you to realize authentic piano performances without absolutely no compromises. Via a second SuperNATURAL-based sound engine, the RD-2000 gives you access to a wide range of classic electric pianos from the '60s, '70s, and '80s. Included are newly developed recreations of the RD-1000 (the very first RD stage piano) and MKS-20 sound module from the 1980s. Driven by Roland's milestone SA technology, their unique musical voices are instantly recognizable from that era's hit records. Vintage effects are also on hand for processing your EPs, including the famous BOSS CE-1 Chorus and Roland SDD-320 Dimension D. Visit Roland's special RD history page for more background on these and other classic instruments and effects, plus sound demos of the recreations found in the RD-2000. The PHA-50 progressive hammer-action keyboard with escapement is the ideal platform for playing the RD-2000's responsive acoustic and electric pianos. This innovative keyboard features hybrid keys constructed of wood and molded materials, combining classic feel with rugged durability. Together with Roland's advanced sensor mechanism and hammer-action design, the PHA-50 delivers authentic grand piano touch that's right at home under your fingers. Via the RD-2000's USB audio/MIDI interface, it's easy to integrate software instruments with a studio DAW or a laptop running your favorite host software on stage. You can control soft synths with zones along with internal sounds, and route their audio through the RD-2000 to create a powerful hybrid rig. The interface supports 24-bit audio at rates up to 192 kHz, allowing you to access your highest quality sounds. The RD-2000 supports Roland's newly developed RAINLINK protocol, which provides high- resolution velocity control for compatible software instruments. This ability is particularly effective for deriving the subtlest tonal nuances out of supported software-based pianos. - Actual weight can vary slightly from that indicated due to the fact that wooden parts are involved. "Roland has done it AGAIN!!!!!" Style of Music: R&B, Pop, Hip Hop, Gospel, CCM...and whatever else I get hired for. Style of Music: Christian - Southern Gospel.